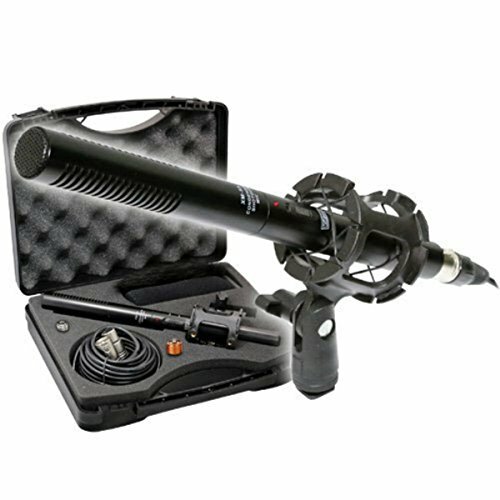 Record professional quality audio for your video/broadcast productions with the Vidpro XM-55 13-Piece Unidirectional Condenser Shotgun Microphone Kit. The 10.8" long mic can be used in conjunction with any camcorder, professional or amateur, and any video-capable DSLR / HD-DSLR. Its durable aluminum construction makes it great for indoor and outdoor shooting. It features superb off-axis signal attenuation for focused audio pickup. Whether for an interview (on or off camera), film shoots, promo videos, or studio recording, the XM-55 is the ideal complete solution. Items included are: long and short on-camera audio cables with multiple connectors to support XLR, 3.5mm mini, and 6.3mm jacks, adjustable shock and stand mounts with adapters for 5/8" (mic stand), 3/8" (boom pole), 1/4" (tripod) and camera shoe mount applications. Also included is a furry wind muff, foam wind shield, a cushioned hand grip, and a hard carrying case.